Belagavi (Karnataka) Sep 15 (IANS) Visiting Belagavi for the first time after becoming President in 2017 on Saturday Ram Nath Kovind recalled that Swami Vivekananda had got the idea of participating in the World Parliament of Religions in 1893 at Chicago in the US in this northwest city of Karnataka about 500 km from Bengaluru. "In 1892 Swami Vivekananda visited Belagavi. I am told the idea of his participation at the World Parliament of Religions in Chicago occurred to him here. As is well known Swamiji made a big impact in Chicago - and we recently celebrated the 125th anniversary of his address there " said Kovind at a function in this historic city. At the Parliament of Religions Vivekananda had said man is not travelling from error to truth but from truth to truth from lower to higher truth. This is so meaningful in the context of education noted the President. Inaugurating the platinum jubilee celebration of Karnatak Law Society (KLS) and Raja Lakhamgouda Law College Kovind said Belagavi had a rich history of learning and wisdom as it was home to Jain monks who brought spiritualism and scholarship thousands of years ago. "Over the years Belagavi has emerged as a symbol of our nation and a notable home for our military community our economic assets and for our cultural and classical music traditions " said Kovind in his presidential address. 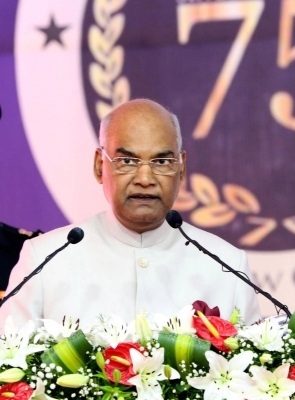 Admitting that higher education was very close to his heart and a priority for his presidency Kovind told the huge gathering that his background had been in the legal fraternity with law not as a profession but a passion. "It is fitting that KLS and its college are located in Belagavi and their event is blessed with the presence of legal luminaries like state Governor Vajubhai R Vala a lawyer by training Supreme Court s Chief Justice of India Dipak Mishra and Attorney General K.K. Venugopal an alumni of the college " pointed out Kovind. Former Chief Justices of India E.S. Venkataramiah and S. Rajendra Babu are also alumni of the law college. During the freedom struggle for Independence Kovind said renowned nationalist Bal Gangadhar Tilak inaugurated the Home Rule League at Belagavi in 1916. "The founding of the Society in 1939 was a part of this illustrious legacy as it was the brainchild of nationalist and socially committed lawyers who thought for the country. They created the Society and the Law College to train young minds and budding lawyers to promote the rule of law and governance by laws " observed Kovind. The Society s founders were skilled lawyers with lucrative practice. Yet they devoted time to the cause of education and even taught in the Law College free of charge. Its co-founder Raja Lakhamgouda Sirdesai of Vantmuri donated Rs 1 lakh to the Society a princely sum those days. The Society runs 14 institutions including an institute of technology a medical college and a management college among others and has 14 000 students on its rolls.